A pair of flowering cherry trees to give you a profusion of pink blooms in the spring in different shades. Contrasting leaf colour for summer colour. Low maintenance and wildlife friendly. Fully hardy with compact growth, reaching approx. 4m (13ft) in 10 years. Supplied as two bare-root trees (1 of each variety) 1.2m tall. 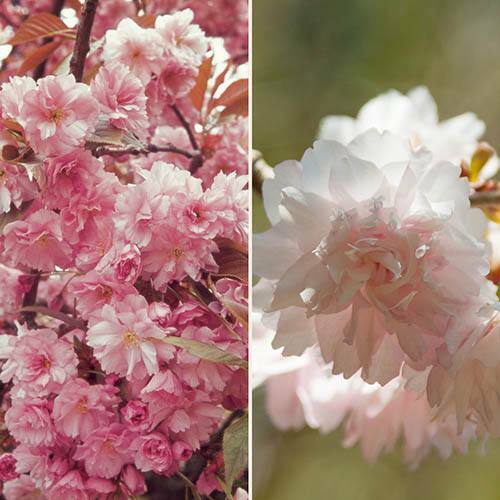 Celebrate the spring with two superb varieties of ornamental flowering cherry trees to give you masses of gorgeous pink blossom in your spring garden. ‘Shogetsu’ is an RHS Award winner with pink flowers and orange-red autumn colour, and is complemented by ‘Royal Burgundy’ with darker pink flowers and deep wine-red leaves. Smothered with exuberant flowers in the spring, this fabulous flowering cherry collection goes on to give you shade in the summer from vibrant foliage, gorgeous colour in the autumn and structure in the winter – providing year-round interest for your garden. A herald of spring, our collection will encourage wildlife into your garden – butterflies and other insects will be attracted to the flowers, while wild birds will find shelter in the branches. Supplied as two bare-root trees (1 of each variety), the trees have a compact habit, growing to approx. 4m (13ft) in 10 years. They are fully winter hardy too. Plant as specimen trees, in a sheltered position for outstanding results. Add Rootgrow Mycorrhizal Fungi to give your plants a head start and establish faster.